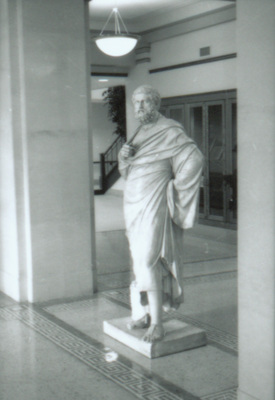 "Sophocles in Seerley May 1994"
An image of the sculpture Sophocles on the campus of the University of Northern Iowa in Cedar Falls, Iowa. The sculpture has been housed in various campus buildings, including Seerley Hall. "Sophocles in Seerley May 1994" (2019). Art on Campus Photographs. 23.